The annual Kelowna Cup gets a little better each year. We start with a report from Dan of the Calgary Kangaroos on this year’s event. “On the men's side of the draw, the combined Edmonton/Vernon team took out the club competition, overcoming Calgary in the decider (5.6.36 v 3.8.26). The British Columbians won the Canadians only game over Alberta (9.4.58 v 3.6.24). On the women's side of the draw, the combined Calgary/Edmonton team won the team competition against the combined Vancouver Vixens/Wildcats team (12.5.76 V 1.0.6). Alberta won the provincial game over BC (no score recorded). Our numbers were slightly down due to the bridge wash-out on Highway 1 at Revelstoke (of all weekends!). However, we had plenty of dedicated players who made the 11+ hour extended drive to Kelowna! We had around 60 men and 40 women. The media Dan is referring to is from the Kelowna Capital News and KelownaNow. 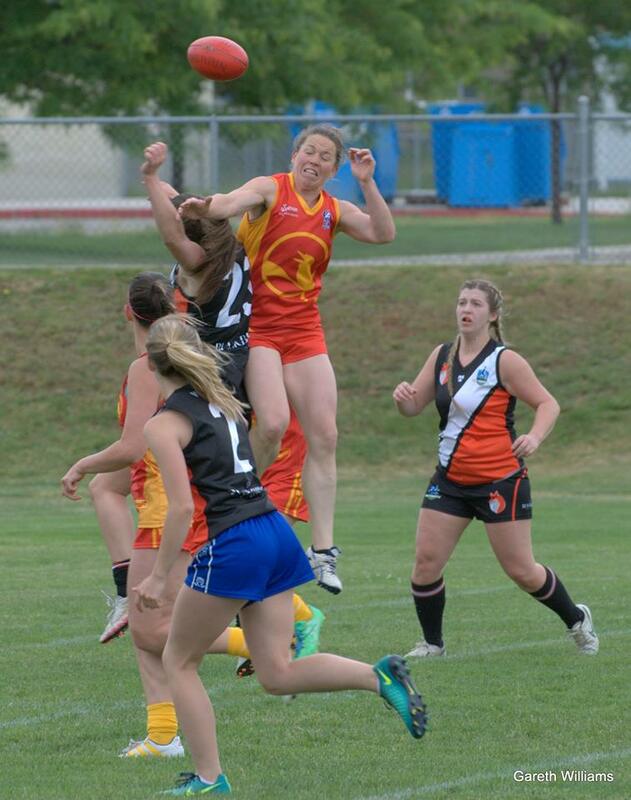 Calgary Kangaroos Australian Football Club director of operations, Dan McLeod, said the 14th instalment of the tournament was important for regional clubs as it gave them the opportunity to play against people that aren’t on their own teams. Although Kelowna had no team of its own, with Vernon currently hosting the closest club, Mr McLeod was optimistic of the sport’s future in the city. 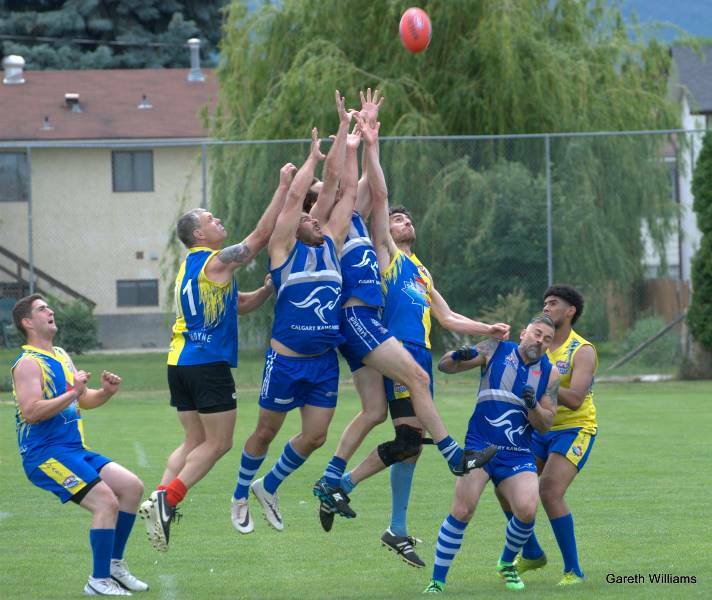 Western Canada’s largest Australian Rules Football Tournament is coming to Kelowna. - KelownaNow and they added to Mr. McLeod’s remarks. The Vernon Roosters are the latest addition to the Canadian football landscape. 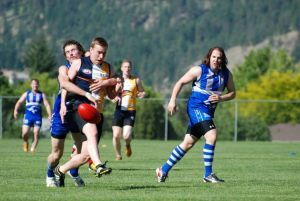 “There is a new Aussie Rules football club based in the Okanagan, known as the Vernon Roosters. The Kelowna Cup has certainly matured from it’s beginning. Here is an edited excerpt from the story of the concept of the games in 2006. It seemed to have benefited Calgary according to Matt Riggs. In 2007 Troy Thompson reports that there was some media coverage. “The Kelowna Cup was a very successful day for footy in Canada held last weekend Sat June 2. The Alberta Canadians won for the second year in a row defeating the BC Canadians. The BC Footy Aussie guys defeated the Calgary Aussies convincingly. Mark Block Canada's national team head coach was there and he was impressed, we may see some fresh talent heading to the Northwind squad for their upcoming clash with the US Revolution team later this year. 2008 saw the introduction of women states Salvatore Cappoferri. Kelowna: Saturday, June 7th, Calgary: Saturday, July 5th (Stampede Cup), Vancouver: Saturday, July 26th. Among the new clubs are the Calgary Kookaburras. The Kookaburras are one of the stronger clubs and are from Calgary, Alberta. They recently sent a squad to the US Nationals in Kentucky and put up a good showing. With plenty of members, the club has plans to begin a small metro league in the Calgary region. The Edmonton North Stars (Facebook page) are a smaller club also from Alberta and currently recruiting players. The Westcoast Wildcats (Facebook page) are also in the Calgary area and will also be competing in the Runge League. Meanwhile the Ontario Ravens have been in formation in Toronto for some years now, and are starting to show signs of getting off the ground. 2013 was a year to be excited about in Edmonton according to Harley Vague. “After much hard work in the off season 2012 was a breakthrough year with the Wombats enjoying successes at the Kelowna Cup and being super competitive in the Stampede Cup against Calgary later in the season. Off of the back of great performances by their National reps, the Emus had their first win over the Calgary Kookaburras at the inaugural Capital Cup. In 2015 The name “Kangaroos” is now reserved for the representative side to compete in inter-provincial and tournaments. Locally, the Bears, Cowboys and Wolves compete for the Calgary Men’s Championship and the Wolves won their maiden title.